Over the past few months we have been working on a new, light weight soft phone. It should be quicker to install, load and easier to use. I need to say you have nailed the slick look and better fit and finish on the 3cx soft phone. How are you differentiating 3cx soft phone from, say, xlite? Well, as you said we include the tunnel, which is very important for 3cx users. But also we include a transfer feature. X-lite users have to pay for call transfer. If you have a 20 user network and they all need the paid version of x-lite, you are talking $1000 just for the soft phone licenses. basically with 3Cx soft phone you can save yourself that money. That said, X-lite is a good phone, so of course we have no problem at all if companies prefer to use X-lite with 3CX. X-lite has a business model around branding their phone for voip providers and this is not something we plan to get into. As screen real estate is expensive, how about an option to have a smaller window? Lots of objects on the form are big, would be nice to have the option to use smaller buttons (sans the alpha characters) and a smaller display (without the large font). 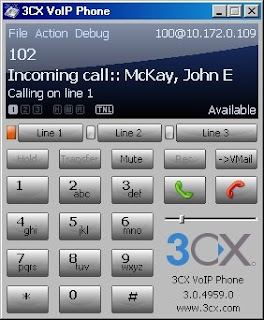 Could the 3CX logo be moved to an about dialog? That also uses up valuable screen real estate! The ability to turn off the gradient background fill would be nice. I'm desperately hoping that you don't make the decision to apply a skin to it! Make skinning an option if you must, but please not the default!